Happiness at work is also sought after by employers, who started their entrepreneurial journeys by bringing a project into the world driven by a passion for their field, and the desire to satisfy a demand and carry out a specific mission. I asked this question to our experts on the way back from CultureFest 2018. The word cloud in this article is a representation of how people responded. The bigger a word is, the more often it appeared as an answer. Of course, there could be as many different answers as there are people on the planet. What I saw, though, was that several of the terms centered around a common theme, or at least, pointed towards a unanimous result: happiness. 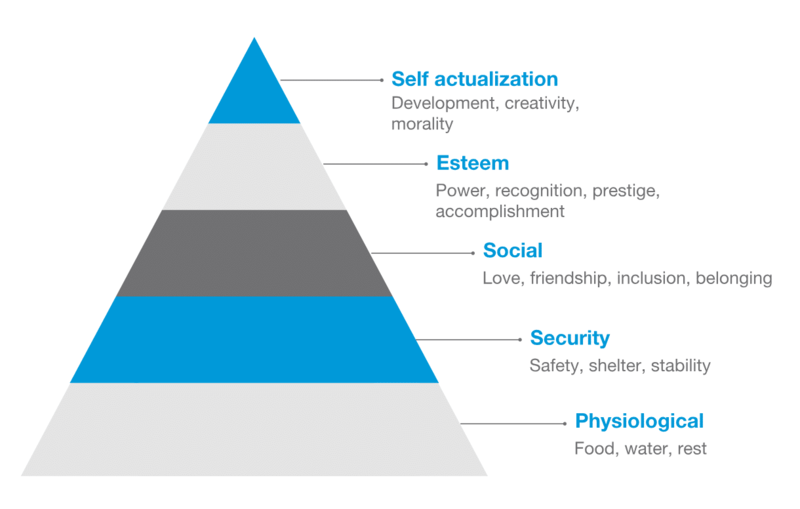 Not so very long ago, job seekers were primarily looking for security, stability and profitability, but the workers of today are looking to get something deeper from their jobs, fulfilling the higher levels of Maslow’s hierarchy. To get the best people on board to help achieve their business goals, a company needs to expand its vision of success, and identify concrete actions to implement to create a positive, enjoyable work environment for employees. This can directly lead to increased employee satisfaction, commitment, loyalty and productivity. The concept of corporate culture has come a long way since the 19th century and we’re seeing it pick up steam in companies in various ways, thanks to emerging technologies and new generations of workers. But what, exactly, is corporate culture? It’s essentially a set of principles and initiatives conveyed to all the members of a company in order to help them have the best possible experience with their employer. It’s similar to what you’d try to offer your customers: a quality product and an unforgettable experience that will lead people to stay loyal to your brand and act as ambassadors for other potential customers. From the moment it was founded in 2002, Adviso planned to incorporate this concept into the core of the company and all its activities. Which means that for just over 15 years, workplace happiness has been etched into the hearts of our two partners, Simon Lamarche and Jean-François Renaud. When you work in an environment like this, that makes so much sense on a human level, it’s surprising to look around you and see that large companies with extensive means are not even able to offer their employees work/life balance, for example. A ministerial committee on work/life/study balance was launched in October 2017, specifically to better respond to the needs of Quebec’s workers. It goes without saying, when even the government is able to justify the creation of this kind of committee, that the desire for change and innovation is getting more blatant. There’s still work to be done in many areas, like for example, social equity in the workplace, professional development, recognition, etc. How can you make employees happy at work? For our big family of nearly 90 people, it’s critical that each and every person is able to achieve their full potential. Whether that’s through an annual professional development plan, social and team-building activities, involvement with non-profit organizations or the opportunity to get fresh fruit at the office every morning, our mission remains intransigent: making sure that our employees are satisfied, so that they will be motivated to fully commit to their work day after day. Of course, we can’t talk about missions and goals without talking about measurement! Not only are we experts at calculating the performance of your campaigns, we’re also pros at evaluating the morale of our troops and collecting employee feedback using tools like OfficeVibe. This makes it possible for us to optimize, in other words to intervene and implement targeted solutions when needed. For example, if all the members of a team tell us that they have been at full capacity for a prolonged period, it’s critical for us to provide them with the supplementary resources they need to be able to continue delivering the same quality of work to clients. People are at the center of every organization. Without its workers, however many or few, a company cannot succeed. So logically, it’s extremely important that these workers be mentally and physically healthy! People resigning because of problems at work. It goes without saying that the cost associated with these situations is huge, to the individual, the company and society. On the other hand, investing in preventative measures by making resources available to employees could prevent issues like anxiety or burnout from being so pervasive. The same holds true for employees’ physical health, particularly in a digital context like at Adviso, where employees are required to work in front of a computer for the majority of their days. Investing in office furniture that’s adapted to the work environment, providing different kinds of workspaces, adjustable standing desks, for example, and offering to pay for personal athletic challenges, big or small, can make a huge difference to the physical health of your team! Corporate culture: where to start? Obviously, every company has a different budget, but the drive to reinvent yourself and do better for the people responsible for your success is incumbent on all of us. Here’s an exercise you can try next time you’re out with friends, whether you’re a digital marketing specialist, a professional working in another field, a manager or even the president of your company. Do I feel invested and involved in my job/company? Why? Do I have the opportunity to evolve and develop in my job/company? Do I have the opportunity to balance work and family in my job/company? Is there a real spirit of collaboration among my colleagues and/or with my immediate superiors? Is my work recognized by my peers? Is there conscious or unconscious discrimination in my work environment and processes? What can I do, as an individual, to create change? Nicknamed Happiness Attendant since joining Adviso in April 2016, Rachel works closely with operations, recruitment and management to provide employees the best possible work experience. With her years of work in event management, staff training and customer service, as well as a (great) touch of madness and overflowing imagination, she is the perfect person to help maintain the well-being of Advisians on a daily basis.